The Insignia Sports Tourer grows 80mm to 4986mm, making it longer than the wagon versions of the Mercedes-Benz E class and Audi A6. GENEVA -- Opel/Vauxhall believes the improved quality and upgraded technology in the new Insignia will help it lure customers from premium equivalents such as the BMW 3 series. Those upgrades include a head-up display, semi-autonomous lane-keeping assist, a pop-up hood to aid pedestrian protection and the latest generation of Opel's IntelliLink infotainment system that can be used with a wifi hot-spot function. “If buyers look at what this car delivers in terms of styling, functionality and features and then looks at what they need to pay, they would think it was a good alternative,” to models from premium brands, Insignia chief engineer Andreas Zipser told Automotive News Europe at the Geneva auto show this month. 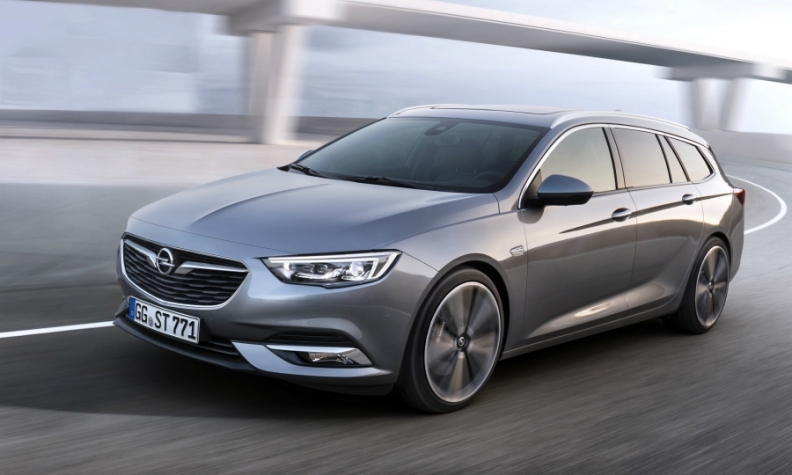 The new Insignia Grand Sport hatchback and Sports Tourer station wagon, which were unveiled in Geneva, also start at 25,940 euros in Opel's home market of Germany while the BMW 3 series starts at 30,900 euros there. The new Insignia is the second model to be built on General Motors' Epsilon 2 platform after the Chevrolet Malibu. As with the previous-generation Insignia, the new car is expected to form the basis of the next Buick Regal, despite GM's plans to sell the Opel and Vauxhall brands to the PSA Group. The new platform is longer that the Epsilon 1 platform it replaces, giving passengers more space inside. “We were responding to criticism that space was tight for rear passengers in the first Insignia,” an Opel spokesman said. The hatchback is 55mm longer while the Insignia Sports Tourer grows 80mm to 4986mm, making it longer than the wagon versions of the Mercedes-Benz E class and Audi A6. The car is also up to 200kg lighter and the driver sits 30mm lower than before. Both help the Insignia feel more sporty, Opel claims. “This car is a driver's car at the end of the day,” Zipser said. The most powerful model is uses a 260-hp 2.0-liter turbocharged gasoline engine mated to an eight-speed automatic transmission. The car is also available with a new 1.5-liter gasoline unit that offers either 140 hp or 165 hp. The new powerplant is from the same family of turbocharged gasoline units as the 1.4-liter four-cylinder and 1.0-liter three-cylinder engines GM developed in conjunction with China's SAIC Motors. The new Insignia also is offered with either a 1.6-liter diesel in 110 hp or 136 hp outputs or a 2.0-liter 170-hp diesel. Opel says the Insignia's fuel consumption is, on average, 3 percent better than its predecessor based on the Worldwide harmonized Light vehicles Test Procedure (WLTP). The design of the car was influenced by the Opel Monza concept that debuted four years ago at the Frankfurt auto show. One of the elements borrowed from the Monza was the chrome so-called “Opel Blade” that runs along the roofline of the wagon into the rear lights. Opel CEO Karl-Thomas Neumann described the car as a “true flagship” for the brand at the Geneva unveiling.